Punks like to think that they invented that DIY idea where anyone could get up and form a band. But no! There is nothing new. I was only able to join in with punk because, many years earlier, my dad had been much taken by the 1950s skiffle movement. The idea of skiffle music swept across Britain in the late 1950’s, with its casual clothes, American folk and music of Black origin. 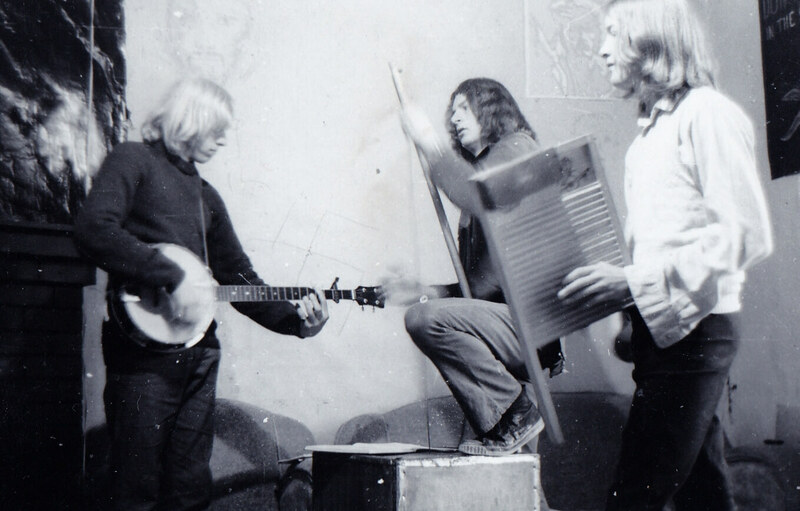 But the most innovative part was the idea that you could make a band with homemade instruments – like a T-chest bass or a washboard played with thimbles on your fingers. It’s hard to find many female players involved with the scene. A few were singer/guitarists, but apart from the T-chest playing woman on the picture of The Peepel above, it seems to have been a mainly male pursuit. However, my dad fancied being in a skiffle band, so like many guys his age, he bought a guitar in about 1960. The guitar sat around the house unplayed for years and years. Until the next wave of DIY music came along and I picked it up as a punk guitar. So, musically skiffle isn’t much like the punk I tried to play, but the spirit is the same. Thanks, Dad and thanks, skiffle music.